HVLP paint sprayers offer advanced technology to provide a high-volume and low-pressure system. These sprayers are becoming more popular than the traditional paint sprayers, and it’s no wonder why. They offer less overspray, they are safer and more economical. To provide a quality finish to your projects, you’ll need to find the best HVLP paint sprayer on the market. Here is a quick guide to help you find what you need. Want more detailed information? Follow my simple guide below to learn everything you need to know. 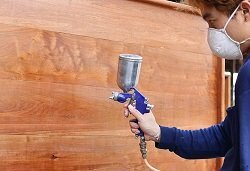 With a conventional paint sprayer, you will need a compressor to supply the high pressure. Airless paint sprayers have this function built in and use electricity to achieve this high pressure. While this can provide a great spray, the high-pressure can often cause overspray. This leads to the waste of paint and contaminates the environment. HVLP paint sprayers use high-volume and low-pressure which helps to control the flow of the paint. Because of this, your risk of overspray is diminished and you can feel safe that you aren’t causing damage to the environment. The low-pressure technology creates a safer painting environment. Fewer materials will be used to do the same job. Economical due to a reduction in overspray. Regulators control the pressure of the materials. You can easily adjust fan size. Work best with lower viscosity materials. You can thin your materials if needed. HVLP paint sprayers are great for a multitude of uses. Anywhere that you would have used a traditional paint sprayer can benefit from an HVLP sprayer. There are two main paint sprayers to choose from. The sprayers with air turbines don’t use a compressor. They are still able to atomize and propel the paint to supply a superior finish. The sprayers that do have an air compressor are more similar in nature to a traditional sprayer. The biggest difference is that they operate at a lower pressure. Most of the features that differentiate models come from the PSI or pressure and the nozzle or tip. The tips often have differing spraying abilities allowing for broader and/or finer coverage when painting. This is helpful because certain models of spray guns are better suited to certain paint jobs. For example, Fuji spray systems are excellent choices for automobiles while Wagner is best for smaller, detailed tasks. Before you shop for the best HVLP spray gun, you will want to check through some quality reviews. Also, consider what type and size you desire. If you plan to use additional tools, keep that in mind before making your purchase. Beginners will want to start out with a low-volume, low-pressure paint sprayer. Handling this type of sprayer might require a little more skill than a beginner would have. Fortunately, there are plenty of videos including one at the bottom of this page. We also have a helpful guide here. If you are experienced in using paint sprayers than an HVLP is a great option for you. Here’s my pick for the 10 best HVLP paint sprayers currently on the market. They represent a variety of projects and are designed for experienced and inexperienced painters. They represent a variety of projects and are designed for experienced and inexperienced painters. To tackle all of your DIY projects, this powerful 2-stage system is the clear winner in many regards. The Fuji M-Model Spray Gun to offer professional features such as a non-bleed spray. It offers the Fuji M-Model Spray Gun to offer professional features such as a non-bleed spray. It also features the fan control knob so you can adjust pattern sizes from small circular to wide, and everything in between. The powerful 1400-watt 2-stage bypass motor is housed in a metal turbine case that has a gun holder for portability. This system can handle any type of coating and is best used by an experienced sprayer. Fuji has produced an all-round excellent gravity feed HVLP spray station. The power and precision make this a top choice for painting automobiles. This indoor and outdoor, portable paint system comes with its own integrated storage system. The innovative iSpray nozzle is for broad surface coverage and works with unthinned paints. The Detail Finish nozzle is perfect for finishing projects. This Wagner features the X-Boost Turbine which creates intense spraying power. It is also controlled easily with the adjustable options and low overspray. When you aren’t using the nozzles are 11.5-foot hose, you can easily store them in the Power Box. By covering an 8’ x 10’ wall in 5 minutes with unthinned latex paint. The Flexio 890 has over 1000 reviews on Amazon, making it a widely used product. It convenient to use, resiliant and clean up is simple. My favorite for quick jobs! Designed with the light contractor in mind, this Spray Station is a professional gun with a powerful turbine. The 5500 includes a 650-Watt turbine that generates 42CFM and 2.2PSI. It also comes with a 13-feet hose and 5.5-feet power cord. Use the onboard storage for the spray gun when it is not in use. The gun features a 2.0mm stainless steel tip and needle. You’ll also receive a 1-quart PTFE coated paint container with quick release lever. This model features the Push N Click 3-spray pattern changing system, paint volume control dial, and dynamic control action trigger. The Earlex is a mid range model with high performance. The design is awesome and moving it around is simple. Great performance at a reasonable price. This compact and lightweight spray gun are best used in hard to reach areas. The professional grade metal cup is ideal for the smaller fine finish applications. Use the variable flow trigger to dial in the spray pattern width from 1-inch to 10-inches. The powerful 2-stage turbine sprays latex as well as the thinner materials. The variable air pressure control means less overspray. Use the 20-foot high-flex air hose to extend your reach. The 3-spray patterns help you choose what is best for your job. Another solid Wagner model that I love (I only feature the quality sprayers). The control spray give just that. Excellent control. Slightly better priced than the Flexio, this model is good for any DIYer. The Mini-Mite 3 Platinum system features a T-Series spray gun and a powerful 3-stage turbine motor. This supplies approximately 6psi which is enough pressure for most coatings when properly thinned. The T-70 spray gun is a non-bleed model and features a side-mounted pattern control knob. Fuji also includes a 1-quart cup. The air cap set is ideal for fine finishing because it supplies a 1.3mm tip. This set is easy to maintain and ideal for the beginner to professional. It is an industrial rated machine with a heavy-duty metal case. It comes complete with a 25-ft high-flex hose, cleaning brush, wrench and 20-page user manual. Finally, the heat dissipation box allows the heat to be removed from the turbine case. Fuji is the leader with these turbine spray systems and this is another top of the range product. You cant go wrong if you want to spend the money on quality. This 400-watt system can spray sealers, urethanes, lacquers, and varnishes with ease. It produces a continuous flow through the adjustable air cap, allowing for 3 different positions. You can use the vertical fan, horizontal fan or round pattern. Controlling the fan pattern is easy with the adjustable knob. Simply choose a wide 12-inch pattern to a small pattern less than an inch and everything in between. You will receive less overspray than with a regular sprayer. In addition, the job will take a fraction of the time from using brushes and rollers. This can be used on kitchen cabinets, patio furniture, fences and just about anything that needs a fresh coat of paint. It also comes with a 12-year warranty, so you can feel good about the purchase. I haven’t tried this one yet but my neighbor loves it. It’s priced very reasonably on Amazon and he seems to be using all the time. This siphon feed gun is small and easy to take anywhere. The cap can hold 600cc of liquid and the air consumption is 80-100 liters/min. An ergonomically designed body is equipped with the stainless steel nozzle ranging from 1.0 – 1.8mm, is excellent for tackling most any home improvement project. The cup lies on the downside to make the siphon feed capable of coating more than gravity feed sprayer. This system is easy to clean and works with latex paints, lacquers, and stains. This siphon feed spray gun features a 1-quart aluminum cup. It also weighs just 3 pounds to make any job easy on the hands. The operating pressure is 50-60psi and average air consumption is 7-12cfm. The gun comes with a 1.8mm nozzle for fast application of primers, heavier coatings, and glues. It does require a 3hp compressor and is perfect for use while woodworking, painting boats and much more. This unit will reduce waste and increase productivity. It also comes with a 1-year warranty on materials and workmanship. This is best used with thinner materials such as sealers, lacquers, stains and varnishes. It has an outdoor rated air turbine to allow for a continuous flow of material. It produces a professional looking fine finish on any project. The 3-position air cap will adjust the spray pattern. Choose from a vertical fan, horizontal fan or round pattern shapes. Use the variable trigger to spray ½-inch wide to 6-inch wide patterns. With a setup in less than 5 minutes and clean up in less than 10, you are going to be spraying those jobs in no time. This self-contained machine requires no hoses, pumps or air compressors. It is designed to refinish, repurpose and up-cycle your existing furniture. This is great for the beginner or advanced user alike. With an adjustable spray control, you can paint horizontal, vertical and circular. The brass spray needle and housing allow for a longer machine life. In addition, you can add on the Rapid Clean C900042 and the Spray Shelter C900038 to give this unit even more versatility. This set comes with the sprayer, cleaning brush, viscosity cup, and an air blowing nozzle. Super performer for newbies who want to spray small items like chairs, old furniture and more. Lightweight and affordable. By choosing the best HVLP paint sprayer, you are setting yourself up for a quality job. With some additional practice, you will soon be painting like a professional. Use the HVLP paint sprayer you choose to make just about any painting job easier. Use the HVLP paint sprayer you choose to make just about any painting job easier.